It was a long road to the third Monday in January when all 50 states will observe the birth of Martin Luther King, Jr. and the day named in his honor in their own unique ways. Largely owed for making the dream of a King holiday a reality is Stevie Wonder, who back in 1980, wrote the pointed song “Happy Birthday,” then launched a 41-city U.S. tour (and invited Gil Scott- Heron along) to promote the idea which was first mooted by Rep. John Conyers in 1968. The musical efforts were ultimately the key in collecting the millions of citizen signatures that had a direct impact on Congress passing the law signed by President Ronald Reagan in 1983, declaring a day for MLK. Observed for the first time in 1986, some states were late to the party, however, by the turn of the 21st Century, all were united in some form of remembrance of the civil rights giant. “Happy Birthday”, which served as the Wonder-campaign theme (and is now the “official” King holiday tune) is the last track on Hotter Than July. The album also features “Master Blaster”, Wonder’s tribute to Bob Marley who had been scheduled for the tour until he fell too ill to participate. Stepping into the breach was Scott-Heron whose 2011, post-humously published The Last Holiday, details his own journey with music and activism, while it retraces the long and winding road Wonder took to bring home a US federal holiday with the help of a song. The tour brought Gil and Stevie to Oakland, where they played in the name of King, as did Rodney Franklin and Carlos Santana, on the shocking night John Lennon was killed (though that is a story better read in Scott-Heron’s memoir). In King’s birthplace of Atlanta, Georgia, the King Center, has a full schedule of events currently underway; the celebrations and various symposiums are of course dedicated to the King’s teachings in non-violence. In San Francisco on January 21, there will be an all-day celebration of King’s life at Yerba Buena Center for the Arts from 11 a.m. — 5 p.m. The City of Santa Monica also has a full weekend schedule of events beginning on Friday. 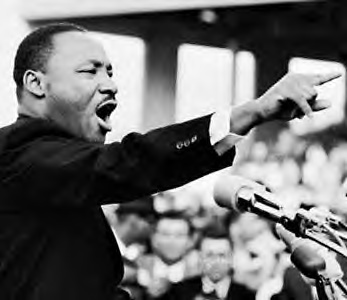 The photo above was of course taken during the historic “I Have a Dream” speech, delivered on August 28, 1963 at the March on Washington now in its 50th anniversary year. Had he lived, Dr. King would’ve been 84 today—and still dreaming.